MS Excel is mainly used for preparing tables and doing various kinds of numeric calculations. But I think it would be a plus point for you if you know all the MS Excel shortcuts. 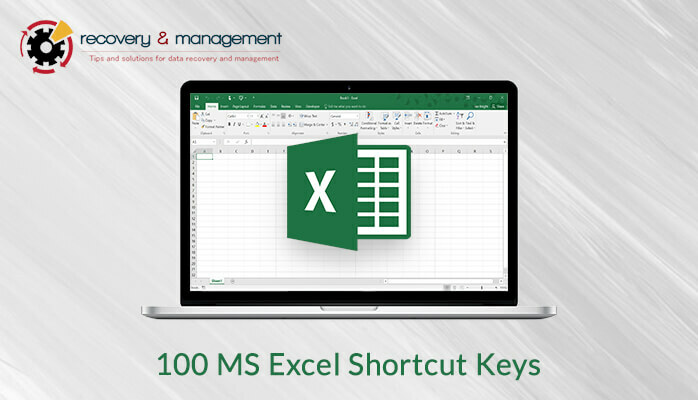 So in this article, I’ll tell you various shortcut keys in MS Excel 2013 so that you can save your time and effort. Why should you use a keyboard and mouse combination when you can do everything with the keys? So there are many shortcuts which can help you to do your task easily. I am going to segment the shortcut keys according to their usage. Create a New Workbook- Ctrl + N.
Open a Workbook- Ctrl + O. Save a Workbook- Ctrl + S.
Print a File- Ctrl + P.
Open Print Preview- Ctrl + F2. Close Current Workbook- Ctrl + F4. Close Excel- Alt + F4. Collapse or Expand Ribbon- Ctrl + F1. Move to Next Ribbon Control- Tab. Open or Activate Selected Control- Space. Get Help on Selected Control- F1. Create Chart in New Worksheet- F11. Create an Embedded Chart- Alt + F1. Find Previous Match- Ctrl + Shift + F4. Find Next Match- Shift + F4. Open Find and Replace- Ctrl + F.
Open Find and Replace and Replace Selected- Ctrl + H.
Open Options- Alt + F + T.
Undo Last Command- Ctrl + Z.
Redo Last Command- Ctrl + Y. Copy Selected Cells- Ctrl + C.
Cut Selected Cells- Ctrl + X. Paste Clipboard Content- Ctrl + V.
Open Paste Special Dialogue Box- Ctrl + Alt + V.
Insert a Table- Ctrl + T.
Toggle Auto Filter- Ctrl + Shift + L.
Activate Filter- Alt + Down Arrow. Select Table Row- Shift + Space. Select table Column- Ctrl + Space. Select All Cells- Ctrl + A. Clear Slicer Filter- Alt + C.
Toggle table All Rows- Ctrl + Shift + T.
Cut Cells- Click + Drag. Copy Cells- Ctrl + Click + Drag. Insert Cells- Shift + Click + Drag. Insert Copy- Ctrl + Shift + Click + Drag. Drag Worksheet- Alt + Click + Drag. Drag Duplicate Workbook- Ctrl + Drag. Now, let’s move on to some more shortcut keys in MS Excel 2013. Right Cell Movement- Right Arrow Key. Left Cell movement- Left Arrow Key. Upward Cell Movement- Up Arrow Key. Downward Cell Movement- Down Arrow Key. Right Screen Movement- Alt + Page Down. Left Screen Movement- Alt + Page Up. Up Screen Movement- Page Up Key. Down Screen Movement- Page Down Key. Right Edge Cell Movement- Ctrl + Right Arrow Key. Left Edge Cell Movement- Ctrl + Left Arrow Key. Top Edge Cell Movement- Ctrl + Up Arrow Key. Down Edge Cell Movement- Ctrl + Down Arrow Key. Move to Begin Row- Home Button. Move to the Last Cell of the Sheet- Ctrl + End Key. Move to First Cell of the Sheet- Ctrl + Home Key. Turn on End Mode- End. Go Back to Hyperlink- Ctrl + G + Enter. Select Entire Row- Shift + Space. Select Entire Column- Ctrl + Space. Select Whole Worksheet- Ctrl + A. Select Adjacent Cells- Shift + Click. Select Non- Adjacent Cells- Ctrl + Click. Move Rightwards Between Non-Adjacent Cells- Ctrl + Alt + Right Arrow Key. Move Leftwards Between Non-Adjacent Cells- Ctrl + Alt + Left Arrow Key. Toggle Add to Selection Mode- Shift + F8. Select Active Cell only- Shift + Backspace. Show the active cell on the worksheet- Ctrl + Backspace. Move Active Cell Clockwise in Selection- Ctrl + Full Stop key. Move Active Cell Downward in Selection- Enter. Movement of Active Cell Upwards- Shift + Enter. Movement of Active Cell to the Right- Tab Key. Move Active Cell to the left- Shift + Tab Key. Open Absolute and Relative References- F4. Open Insert Function Dialogue Box- Shift + F3. Autosome Selected Cells- Alt + “=”. Toggle Formula On or Off- Ctrl + ` “Grave mark”. Insert Function Arguments- Ctrl + Shift + A. Apply Array Formula- Ctrl + Shift + Enter. Calculate Active Worksheet- Shift + F9. Force Calculate All Worksheet- Ctrl + Alt + F9. Evaluate Part of a Formula- F9. Collapse or Expand the Formula bar- Ctrl + Shift + U. Open Function Arguments Dialogue Box- Ctrl + A. Define Name– Ctrl + F3. Define Name in Rows and Column labels- Ctrl + Shift + F3. Paste Name into Formula- F3. Accept Function Without Auto Complete- Tab. Select Pivot Table- Ctrl + A. Open Pivot Table Filed Checkbox- Space. Group Pivot Table Contents- Alt + Shift + Right Arrow Key. Ungroup Pivot Table Contents- Alt + Shift + Left Arrow Key. Create Pivot Table Chart on the same Worksheet- Alt + F1. Create Pivot Table Chart on New Worksheet- F11. Open Pivot Table Wizard- Alt + D + P.
Well, I have told you the various shortcut keys in MS Excel 2013 and it is totally up to you to apply them according to the requirement. I can guarantee that these shortcuts will save a lot of time and energy. In the beginning, it will be quite difficult to memorize the shortcut keys but once you start applying it on a daily basis while preparing the excel sheet then you will get used to it. If you are facing any kind of error while applying shortcut then your Excel file is corrupted. Try to repair it using an Excel Repair Tool. You have to download the software and upload the excel file. In no time it will repair your file and then you can easily apply all the shortcuts.